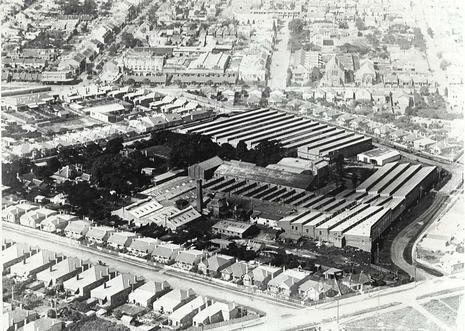 We start and finish at Newtown Station, and visit Foodcraft Espresso and Bakery at Erskineville, the nut factory at Waterloo, Black Star Pastry and others at Rosebery and the Carriageworks Farmers Market. Don't forget your backpacks, baskets and panniers. 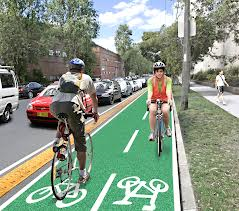 On Saturday 30 March 2019 you can ride with Bike Marrickville to the Edge Greenway event at Lilyfield. Edge will feature free bike maintenance checks, prizes for the best dressed or decorated bikes and artist-run bicycle bling workshop for all ages. Flyer is attached. Meet us at Bedford Crescent Dulwich Hill, near the heavy and light rail stations, at 2.30pm to ride via the Greenway to Lilyfield, with a return ride at 5pm. Bring your bike already blinged or join the workshop at the event. Bike groups in the Inner West are getting together to hold a pre-election community ride, ending in a picnic in Jubilee Park, Glebe Point. The main ride starts at 11 am at the Treillage Tower (google +code 532H+RJ ) in Bicentennial Park, Sydney Olympic Park, and will follow quiet roads and paths through Concord and Fivedock to Leichhardt and Glebe, distance 13 km. Bike Marrickville will lead a shorter ride to the picnic, leaving from Marrickville station. Time: 10:45am for 11am start. Return approximately 2.30pm. Ride to Clovelly Beach for a swim via Centennial Park and Waverley Cemetery, then return. Bring: Your own bike in good order, helmet essential, swimwear, phone, cash, spares and locks, . ​Join us for a start of summer ride from Tempe to Cronulla with a coffee stop before returning by bike or train. Trail: Around 25 kms one way, predominately flat. Bike trails and bike friendly minor arterial roads. Ride via the Greenway and find out about the "missing links" project to create a continuous cycleway. 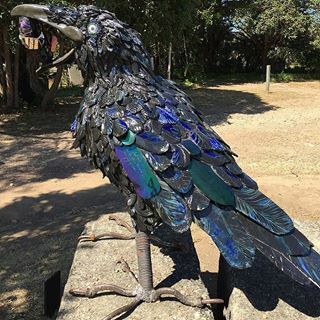 Ride with us on the first day of spring to Hidden, a free public outdoor sculpture exhibition that takes place every year amongst the gardens and graves in one of the oldest sections of Rookwood Cemetery. Join us to visit two beautiful historic houses, Tempe House and Elizabeth Bay House, and learn about their connections. We will ride on back streets and cycle paths at an easy pace. Bring $12 for entry fee to Elizabeth Bay House. surrounds, and finishing at the Addison Rd Centre for the On Your Bike exhibition about the history of the Dulwich Hill Cycle Club. Riders must wear a helmet and have a bike in good working condition. Eat your way around the backstreets of Marrickville on an almost calorie-neutral bike tour of chocolatiers, gelato manufacturers, specialty shops and patisserie and confectionary wholesalers you never knew existed. 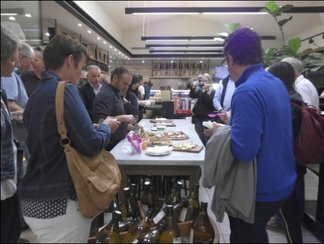 On Saturday 21 April 2018 Bike Marrickville is leading its annual Chocolate and Fine Food Ride to encourage shopping locally and sustainable transport. Refuelling stops at TIM Products, Casa Del Gelato, Adora chocolates and more. Meet 8:45 for a 9am start at Petersham Post Office, corner of Audley and Fisher Sts. Finish back in Petersham at 12:30. An EASY ride (mostly 10 minutes riding then 10 minutes eating...) suitable for all. Join us for our first ride of 2018, an easy paced tour of inner west street art with a coffee stop along the way. Celebrate Bike Week with us on this inner west back streets ride from Tempe to the Big Bike Day at Leichhardt via Addison Rd Markets and Rozelle Markets. Explore some of the waterside suburbs of the inner west - Rozelle, Drummoyne, Chiswick and Abbotsford - and enjoy the views of the bays, coves and river. Route:Cycle paths and back streets, some hills, some traffic, easy pace, approximately 25 km circuit. Bring: Sunscreen, water and snacks. Join us for a winter ride along the Cooks River Valley Cycleway to the historic Rookwood Necropolis. Return by bike to Tempe or by train from Lidcombe. Route: Mainly flat, cycleway and quiet roads, easy pace, 15km each way. Enjoy skirting Sydney Harbour on this easy ride that takes in Blackwattle Bay, the Fishmarkets, Walsh Bay, Barangaroo, and the Botanic Gardens. Join us for an autumn ride along the Greenway and the Bay Run. The GreenWay is an urban green corridor in Sydney's Inner West. It is a bush corridor and a hub for community arts and groups, bushcare, walking and cycling. On Saturday 1 April 2017 Bike Marrickville is leading its annual pre-Easter Chocolate and Fine Food Ride to encourage shopping locally and sustainable transport. 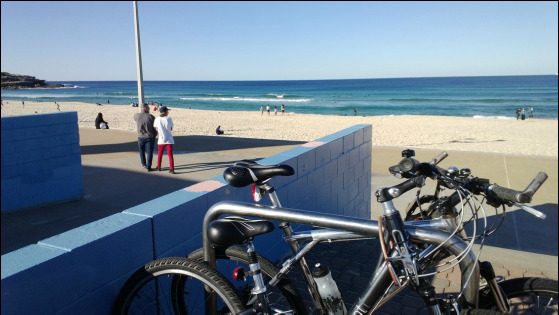 ​Join us for an end of summer ride from Tempe to Cronulla for a swim and lunch before returning by train. Return:Train to Wolli Creek 40 minutes, Sydenham 43 minutes. A flat, back street ride to the beach. Bring swimmers and towel for a dip when we arrive. 9.15 for 9.30am start. Return approximately 2pm. Enjoy Sydney Harbour in spring on this ride that takes in the Fishmarkets, Walsh Bay, Barangaroo, and the Botanic Gardens for a picnic lunch. Start and finish at Newtown Neighbourhood Centre, cnr Australia St and King St Newtown, opposite Newtown Station. Beat the Saturday traffic in this back street tour to Carriageworks, Glebe and Orange Grove Markets. Bring your panniers and backpacks. 8.15 for 8.30am start. Return approximately 1pm. On Saturday 15 October 2016 Bike Marrickville is leading its famous Chocolate and Fine Food Ride to encourage shopping locally and sustainable transport. Refuelling stops at TIM Products, Casa Del Gelato, Georgiou’s Confectionery and more. Register on the Sydney Rides Festival website. Route: Cooks River cycleway to Kyeemagh on Botany Bay and return. Shorter option to Tempe Reserve and return. Route is flat and off road, although there are some road crossings. Approximately 2 hours. Route: Steel Park to Cup & Saucer Creek Wetland and return – an easy ride for about an hour along the Cooks River highlighting environmental improvements. There will be stalls, food and entertainment at Steel Park. On Saturday 12 March 2016 Bike Marrickville is leading its famous Chocolate and Fine Food Ride to encourage shopping locally and sustainable transport. Meet 8:45 for a 9am start at Petersham Station (southern side, outside RSL club). Finish back in Petersham at 12:30. An EASY ride (mostly 10 minutes riding then 10 minutes eating...) suitable for all. A loop ride starting and finishing at Enmore Park and taking in the new parklands at Barangaroo, the new separated cycle paths on Castlereagh and Liverpool Sts in the city, and the first section of the Goods Line. Trail: Quiet street and bike trail ride along (as close as possible) Wolli Creek, M5 motorway(offroad cycle path), Salt Pan Creek(elevated platform – may require some walking), Cup & Saucer Creek(cycle path), finishing off along Cooks River cycle path to Tempe. Effort: 35 - 40 kms return from Tempe Station; some short hills and descents riding between river catchments. 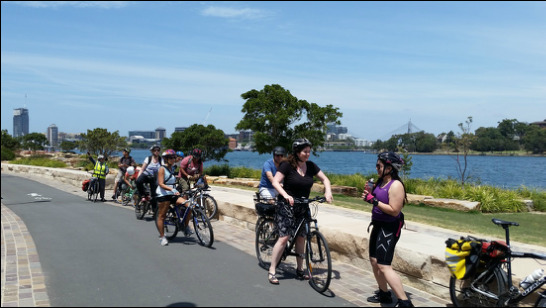 Join Bike Marrickville to cycle along the Greenway corridor from Dulwich Hill to Iron Cove, and then along the Bay Run and return. Come and ride on Marrickville’s first newly finished separated cycleway along Carrington Rd, and then explore some of the neighbouring City of Sydney cycleways from Mascot to Taylor Square. Easy pace, some traffic, approx. 25km.